It is a quarterly journal designed to provide emerging ideas and issues in the management leadership areas. Presents papers, interviews, debates, case studies, and corporate reports that have bearing on organizational leadership and leadership growth in organizations. 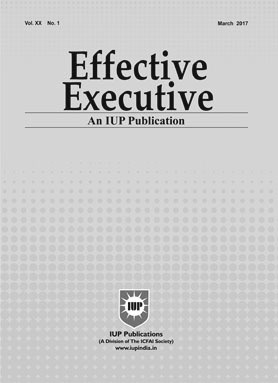 Effective Executive is a management magazine designed for busy executives to help them keep themselves abreast of emerging ideas and issues in the Management area. Contents include articles, interviews, debates, case studies, and corporate reports on the most contemporary issues in management. Contains executive summaries of articles appearing in leading international magazines and reviews of latest management books. Articles are carefully screened and selected to cover a wide range of issues in management. A must read for executives, managers, consultants, and students who are interested in developing cutting edge knowledge and skills in management. A week is a looooong time. Over the course of a week, we say and do a lot of things. Most of those things turn out to be trivial and are quickly forgotten. However, that still leaves an incredible amount of things we said and did that are not trivial. Through social media, news, online reviews, and technology that makes word-of- mouth so much easier and more impactful, employer branding has become a topic of utmost importance. Furthermore, as traditional ‘one-employer’ careers fade away to be replaced by a more positive outlook on ‘job-hopping’ by the current generation, employee retention becomes less about long-term benefits like pension plans and dental care, and more about the immediate advantages of a positive atmosphere and opportunities for development. Motivating team members (or enabling employees to motivate themselves) is a key element to being a good manager or leader. In this paper, the real experiences and best practices are taken from different leaders of different backgrounds and sectors to provide insights into employee engagement, regardless of the situation at hand. This programmatic study makes three key contributions in terms of (1) discipline creation, (2) innovative cross-disciplinary method application and (3) novel and actionable leadership content. First, the pioneering discipline of "Archaeology of Leadership Thought and Knowledge" (ALTK) is invented, consisting of the two subdisciplines of "Archaeology of Leadership Thought (ALT)" and "Archaeology of Leadership Knowledge" (ALK). These new branches of knowledge aim at uncovering long-hidden treasures that can help postmodern leaders to solve truly challenging problems. Second, the author proposes a distinctive methodological approach for these new disciplines, including the application of Qualitative Content Analysis to the field of classical philology. Third, a multifaceted holistic leadership model is created from Xenophon’s Cyropaedia, which fictionally portrays the life of Cyrus the Great. The model includes new transformational concepts for movers and shakers, such as "proleptic leadership", "cordial leadership", "nano-leadership" and "radiant self-discipline", thus demonstrating the game-changing potential inherent in the "Archaeology of Leadership". The collective effectiveness of boardroom teams cannot be assumed and has to be worked at. Boards operate in a business environment of change, uncertainty and insecurity. They are simultaneously confronted with multiple and interrelated challenges and new and unprecedented opportunities. The issues faced by many boards have also become more complex and may have a variety of short, medium and long-term impacts for many corporate activities and, in some cases, most stakeholder groups. They may require collective responses and have implications for how boards operate, governance arrangements and the motivation of directors who feel "out of their depth" and worry whether they are still relevant. This paper reviews two concepts that have only recently been applied to effective leadership: Agency and Communion. Agency refers to behaviors and attitudes that are authoritative, demanding and self-advocating; Communion refers to behaviors and attitudes that are caring, other-serving, and participative. Men get rewarded for being agentic, women get punished for being both agentic and communal. In this paper, examples of both agentic and communal behaviors and attitudes are described. Since effective leadership includes both agency and communion, ways of integrating and combining them are also offered.